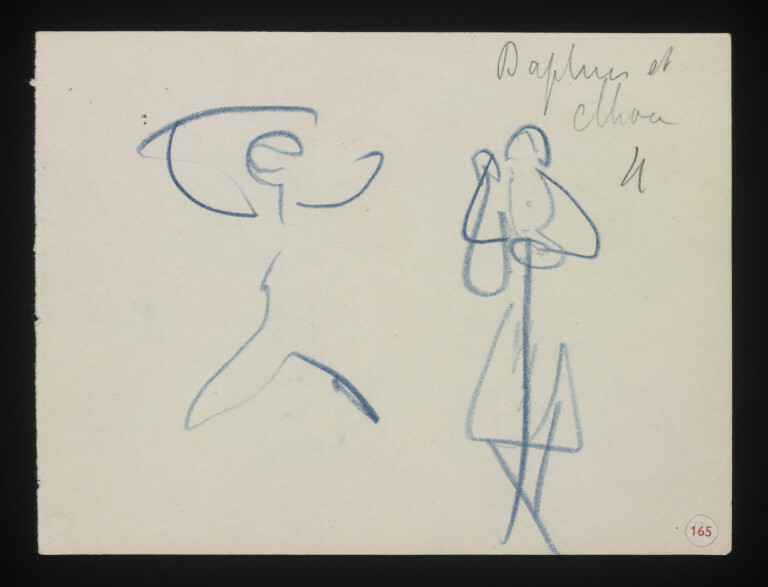 Page of a sketch book showing preliminary sketches made in Théâtre du Châtelet during rehearsal or performance depicting Nijinsky as Daphnis in Scene I in Daphnis et Chloë, Diaghilev Ballets Russes, c 1912. Sketch by Valentine Gross. Diaghilev Ballets Russes Daphnis et Chloë, was first premiered in Paris at Théâtre du Châtelet on 08 June 1912, according to Diaghilev and The Golden Age of The Ballets Russes 1909 - 1929, edited by Jane Pritchard, first published by V&A Publishing in 2010. 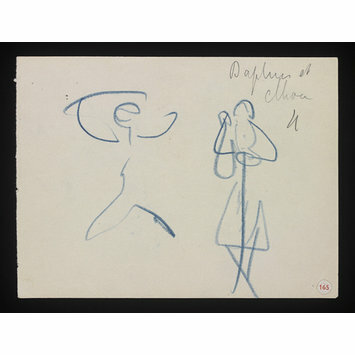 The sketches are part of the Valentine Gross Archive (THM/165), held by the V&A Department of Theatre and Performance. Valentine Gross Archive contains research material and artwork, including sketches, studies, drawings, pastels and illustrations. Only the artwork materials have been catalogued with museum numbers and given item level descriptions found in the Search the Collections webpage. Valentine Gross, a.k.a. Valentine Hugo, was a French art student in Paris in the 1910s. She became a ballet enthusiast, illustrator, researcher and painter. Valentine Gross witnessed annual seasons of Diaghilev Ballets Russes in Paris and made preminary sketches during performances and rehearsals between 1909 and 1914. She later worked them up into pencil or coloured drawings of various degrees of finish including illustrations and paintings. Some of the sketches feature in the book Nijinsky on Stage by Richard Buckle, published in London by Studio Vista in 1971. The two sketches of Nijinsky on the front, one jumping holding the crook above hs head and the other leaning on the crook feature in the book on page 117. Sketch, mostly lines in blue crayon on paper, front and back, detached from original sketchbook.